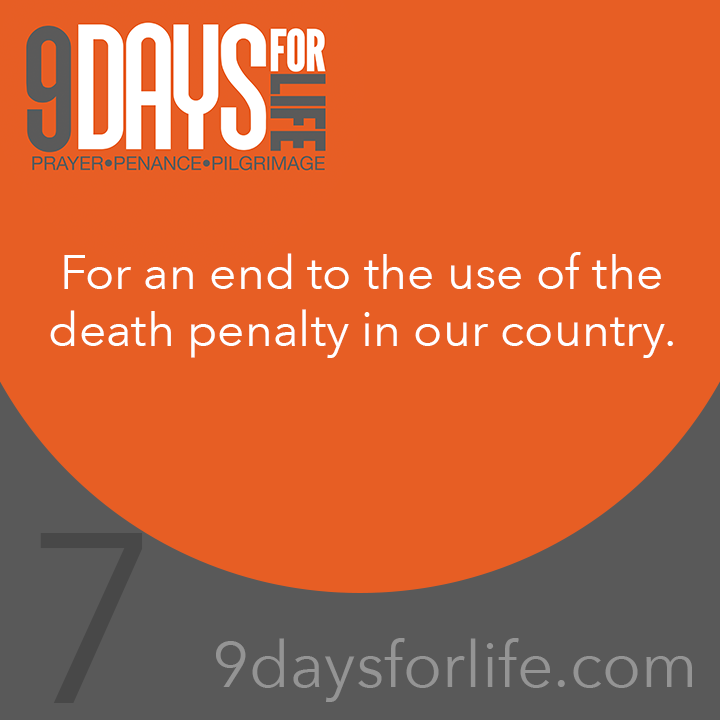 Intercession: For an end to the use of the death penalty in our country. Reflection: As Catholics, we believe and put our hope in a merciful and loving God. We are conscious of our own brokenness and need for redemption. Our Lord calls us to imitate him more perfectly by witnessing to the inherent dignity of every human being, including those whose actions have been despicable. Our faith and hope is in the mercy of God who says to us, "Blessed are the merciful for they shall be shown mercy (Mt 5:7)* and, "I desire mercy, not sacrifices" (Mt 9:13)*. As Christians we are called to oppose the culture of death by witnessing to something greater and more perfect: a gospel of life, hope and mercy. Clean a room in your house without being asked or without telling anyone. Pray for your family members while you clean, “and your Father who sees in secret will repay you” (Matthew 6:6). Read about a Church teaching you don’t understand in the Catechism. Make an honest assessment of your “giving finances” –are you giving too little? Make a resolution to give a set weekly or monthly donation to your parish or favorite local charity. Charles J. Chaput, Archbishop of Philadelphia, summed up the case against the death penalty in these words: "As children of God, we're better than this, and we need to start acting like it. We need to end the death penalty now." Find out why in “Life Matters: A Catholic Response to the Death Penalty” at www.bit.ly/CatholicResponse.